Fast and accurate ? a pregnant result as fast as 1 minute from your missed period. Designed to be the easiest to use, with an ergonomic shaped handle and wide colour changing tip for easy targeting. Accurate - over 9 in 10 women thought Clearblue Rapid Detection gave more accurate results than strip tests (In a study of 111 women in the UK using and reading different test types). Over 99% accurate from the day you expect your period. Easy to grip, long curved handle, and award winning design for easy sampling (Red-dot design award 2012). Easy to read + or - results. No. 1 brand most recommended in a survey of doctors in the UK. 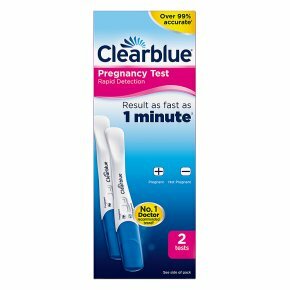 Data on file.Clearblue Rapid Detection Pregnancy Test can give you a ?Pregnant? result as fast as 1 minute when testing from the day of your missed period. You should wait 3 minutes to confirm a ?Not Pregnant? result. It is designed to be the easiest to use home pregnancy test, with wide, colour-changing tip and ergonomic shaped handle. With the accuracy you expect from Clearblue, it's over 99% accurate from the day you expect your period. In a UK study, over 9 in 10 women said they would pay more for Clearblue Rapid Detection than a strip test (based on 111 women using and reading different test types). For more information on this product or answers to your questions, our Careline advisors are available for you 07:00 ? 15:00 hrs Mon-Fri, excluding Bank Holidays. This device is for home use. Keep out of the reach of children. Please read enclosed instructions carefully before use. Clearblue is a trade mark of SPD Swiss Precision Diagnostics GmbH (‘SPD’). Copyright © 2017 SPD. All rights reserved.